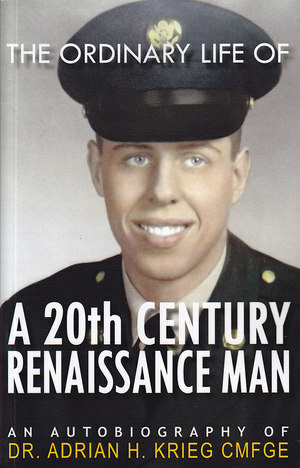 Dr. Krieg’s 16th book is “The Ordinary Life of a 20th Century Renaissance Man” it is his autobiography. It has been in the works since fall of last year. While it is an autobiography it contains the history of a Swiss/American from 1938 to 2014. From his birth to 1952 when he lived in Zürich through the entire Second World War. His immigration and travel to New York and his education or lack thereof, and his successes in various industries to his many achievements, as a CEO for 40 years, with 20 patents, 8 Trade marks, 16 books on engineering, political science and history. Many awards including the best welding invention of 1983, the AWS, NATTCO award and his appointment in the Regan administration to the Clinton administration to the CT/RI DEC (District Export Council) as well as numerous books on the New World Order, and the various secret and semi-secret organizations that run and manage the Western world. And his marriage to Audrey Anne Jones in 1968 on his 30th birthday, and their two sons Ivan and Alistair and their four grandchildren. Since 1974 Dr. Krieg has sold over 68,000 books. A2Z Publications LLC is a closed family corporation that has published Dr. Krieg’s books since 1997. Before that Hallberg and then Elderberry were his publishers. Several of his books were awarded prizes by the Independent Publishers Association, including “Our Political Systems” with Highlighted Title award, and “The New American Newspeak Dictionary” received a reference books award. His last book Published earlier this year was “The System”, which explains how society is controlled and manipulated by a select small group of insiders. A2Z Publication books are advertised in the Washington Times Weekly, American Free Press, Culture Wars, The Sovereign, ANU, The Barnes Review, and various Internet sites.